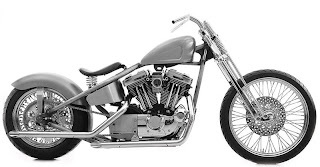 KUSTOMWERKS is stocking the Kraft Tech range of rigid frames that utilize the Sportster drivetrain. Once such example, shown here, uses 11⁄4in tubing and accepts a 180-section rear tire using a stock belt or a 200 with chain drive. All Kraft Tech frames are TIG/MIG welded and accept Sportster engines '86 - '03, and come complete with a manufacturer's statement of origin. Oil tanks, rigid fenders, and fender braces to work with the frames are also available through Kustomwerks.